Cove were founded in 1897 and first played in the Aldershot Senior League, winning Division 4 in the 1930/31 season and then winning Division 2 two seasons later. They then moved up to the Surrey Intermediate League, winning the title in 1950, 1951, 1953, 1954, 1964 and 1968. Four years after last winning the league title, the club joined Division 4 of the Hampshire League, winning the title at the first attempt to earn promotion to Division 3. Promotion to Division 2 then followed in 1977, but the club were then transferred to the Western Division of the Combined Counties League at the end of the 1980/81 season. The following season saw the league revert to a single division, but the club were not transferred again. Cove earned promotion to Division 2 South of the Isthmian League in 1990, moving into Division 3 at the end of the season when the league was restructured. The club then remained at this level until returning to the Combined Counties League at the end of the 1995/96 season, voluntarily dropping down for financial reasons. In the 2000/01 season, the club won the Combined Counties League, but did not take promotion. When a second division was added in 2003, the club were placed in the Premier Division. Despite finishing bottom of the Premier Division in 2004, the club were not relegated to Division 1. This rock-bottom finish was then followed by a few seasons of struggle for the club, but performances gradually improved, culminating in three top-5 finishes in 2012/13, 2013/14 and 2014/15. However, the benefactor funding the squad pulled out, taking his money and the squad with him to Hartley Wintney. Unsurprisingly, this saw the club relegated the following season, finishing bottom of the Premier Division with just 11 points. Relegation to Division 1 has yet to see fortunes improve much, with the club finishing second from bottom last season and experiencing similar struggles this season. In the FA Cup, the club's best run has seen them reach the 1st Qualifying Round, which was most recently achieved in the 2013/14 season when they beat Carterton and Frimley Green before losing 4-0 at Hungerford Town. In the FA Vase, the club has generally fared little better, but they did once reach the 5th Round in the 2000/01 season, beating VCD Athletic, Walton Casuals, Greenwich Borough, London Colney and Croydon Athletic before losing 3-2 at home to Chippenham Town. However, they haven't won a game in the competition since the 2012/13 season. In the week leading up to this game, all the talk was about Storm Brian and how it was set to hit England on the Saturday. However, I did not let this put me off, and instead starting seeking possible games to watch. Initially, I wanted to go to an FA Vase game, with the only viable option being Farnham Town. However, having seen Farnham play just two weeks previously, I wanted to vary things slightly and go somewhere else, although that only ended up happening because, unlike Farnham, Cove responded when I asked them on Twitter about the likelihood of the game going ahead. Because of that, I decided I would head to Farnborough to go watch this game rather than going to Farnham, which ultimately turned out to be a wise decision with Farnham's game seeing the away side have three players sent off and Farnham winning 2-0 (from that alone, I can tell it wouldn't have been an enjoyable game). However, Storm Brian had arrived and was causing all kinds of delays with trains; had the trains not been delayed, I would have gotten to the ground at around 2:10pm, but delays meant I didn't arrive until 25 minutes after that. When I did arrive, I was surprised to find there was no one taking admission money and, as far as I could see, no programmes; the former arrived just before kick off, walking around the crowd and collecting money, while the latter turned out to be behind the bar, which I only found out after happening to see someone else with one. In any event, before I had bought a programme or anyone else, I was surprised to find that someone recognised me as a groundhopper, with it transpiring that the person in question - his name was Dominic - had seen me asking about the game on Twitter, being the man behind Raynes Park Vale's Twitter page and club website. While waiting for food and a drink from the tea bar at the ground (it was very windy and very cold, so I ordered a burger and hot chocolate to warm me up), we had a brief conversation about being surprised to find the ground where it was (down a small road behind a bunch of houses) and also a couple of things about our respective teams (he supports AFC Wimbledon and Raynes Park Vale, while I - as you should know, if you've read my previous entries or seen my Twitter - support Norwich City and Yaxley). After getting my food and drink, and taking a couple of photos (I didn't do a full circuit until half-time, due to how engrossed I was in conversation with Dominic and a couple of other Raynes Park Vale fans) we continued to talk as we waited for the game to start, with a brief interlude for me to buy a programme (it was a lazy, terrible effort with no real information in it, but Cove were friendly enough that I was happy to put another £1 into the club's coffers). 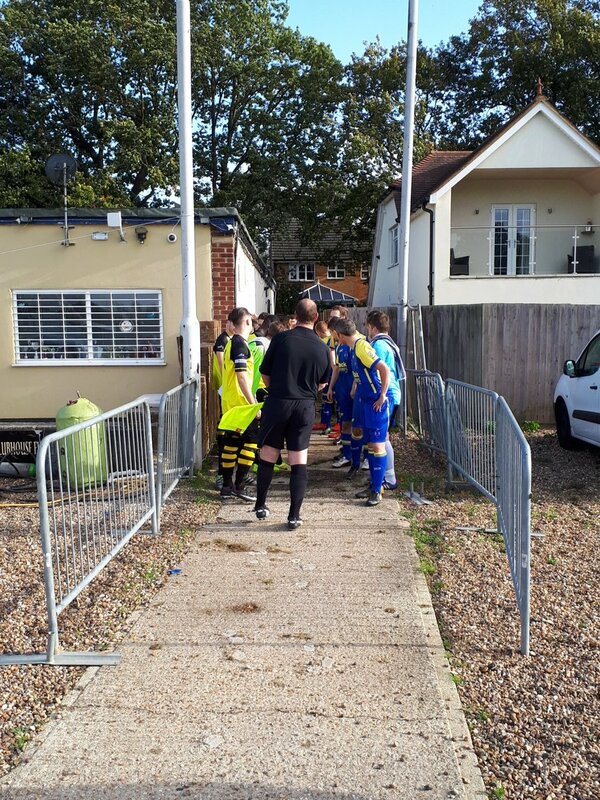 The game was an affair that was extremely low on quality in which Raynes Park Vale only really won because Cove were even worse than they were; had Raynes Park Vale played like they had today against a better team, they would have almost certainly lost. The first goal came on 20 minutes, when a Calum Forbes through ball beat the offside trap (not as though I think Cove were good enough to be intentionally using one; it was likely just inept defending) for Seanan McKillop to round the keeper and tap into an empty net. The second goal followed 15 minutes later, Seanan McKillop setting up Calum Forbes this time, tapping in from 2 yards after a brief goalmouth scramble. In the second half, neither team produced anything of note for a while, with the game instead being dominated by lots of rough tackles and controversial decisions that brought tempers close to boiling over several times (not least when a Raynes Park Vale player elbowed a Cove player and broke his nose, but went unpunished for it). At any rate, a third goal did eventually come, with a Jack Williamson through ball reaching Seanan McKillop who, as with his first goal, rounded the keeper to tap into an empty net. After this, little else of note really occurred, with the last 10 minutes seeing Cove desperately trying to get back into the game and having a couple of decent chances, but in reality they never looked like scoring. 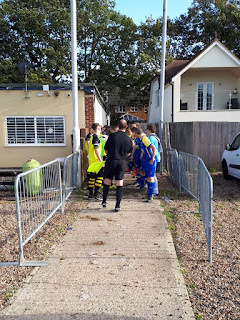 This result, as I was told by Dominic, was the first clean sheet Raynes Park Vale had earned all season and, while Cove never did look like scoring, I could certainly see signs of why RPV struggle defensively. However, the result was never really in doubt, and it's all too obvious why Cove are struggling. After the game, Dominic was kind enough to offer me a lift back to University in Guildford, although we didn't actually leave the ground for another half an hour or so, having a drink from the bar each while he went to talk with the players and management to try and get them together to sort out Raynes Park Vale's ground, which was apparently in such an awful state that the club would be kicked out of the league if they didn't sort it out by January (looking on Twitter, it seems as if this has just happened very recently, which I was glad to see). Overall, while the game was a slight disappointment, the day as a whole was very enjoyable, with both clubs coming across as extremely friendly. 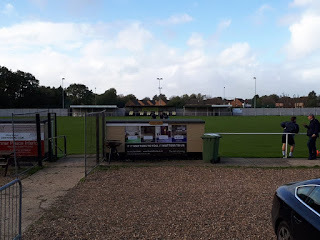 Because of this, I will be more than happy to visit Cove again, should the opportunity arise, and I will soon be visiting Raynes Park Vale as well, now that they have got their ground issues sorted out. Oak Farm is a fairly basic ground, but it is more than sufficient for the club's current needs. All the cover at the ground is on the far side, with an Atcost providing 100 seats surrounded by two areas of covered standing, which overall could probably hold somewhere between 100 and 200 people, when necessary. One of these areas of covered standing also has three seats (like those in the main stand) bolted in the floor, for whatever reason: the best idea I could come up with was that it was some kind of attempt at an area for disabled fans. The rest of the ground is open hard standing, with the only other notable feature being the flag pole in the near corner to the left of the dugouts (if looking at the ground from the clubhouse), which I took a picture of above (it took a good 15-20 attempts to get a good photo of the flag, thanks to Storm Brian). Overall, the ground has a capacity of 2,500, with the record attendance being 1,798 for a league game against Aldershot Town in 1993.